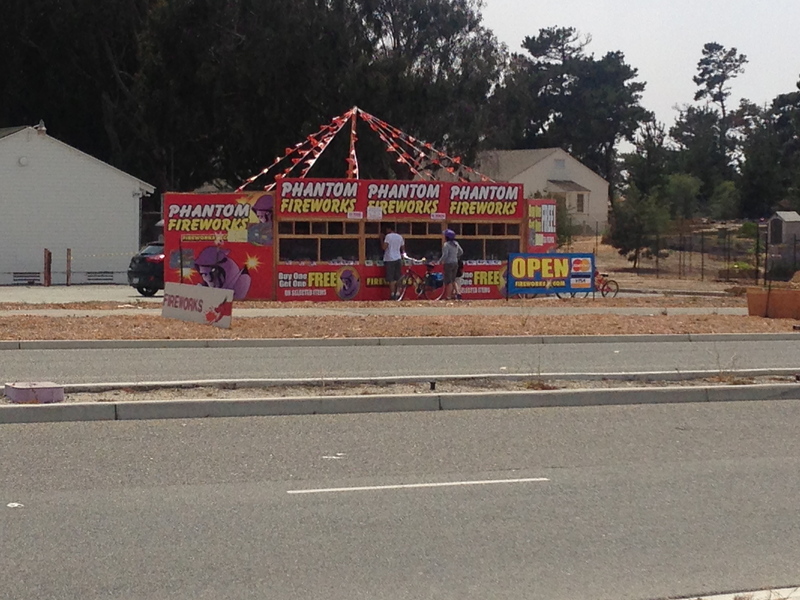 A fireworks stand near the entrance to the bone-dry, brush-covered Ft. Ord National Monument: What could possibly go wrong? In most of the Monterey Bay area the mere possession, much less the actual use, of any kind of fireworks, regardless of how “Safe and Sane” they may be, is unlawful. And there’s a reason for that. According to the National Fire Protection Association, about 5% of all wildfires are started by fireworks and most of those fires occur, obviously, around the Fourth of July (when something like 40% of all fires are caused by fireworks). On July 4, 2011, a fairly typical year, fireworks caused about 17,800 fires nationwide, resulting in 8 deaths and $32 million in property damage. Meanwhile, 9,600 people, more than a quarter of them under age 15, were sent to hospitals for treatment of fireworks-related injuries. 89% of these injuries were caused by LEGAL fireworks. Sparklers, generally considered the most benign of all fireworks (in spite of the fact that they burn at around 1,200 degrees Fahrenheit) caused more injuries than anything else. Cal Fire estimates that they respond to about 500 fireworks-caused fires each year during the weeks surrounding the 4th of July holiday. There are reports that one of the major fires in Colorado last month may have been started by fireworks. You might think that the horrendous tragedy at Yarnell Hill last weekend combined with the fewer, but no less tragic, deaths in last month’s Colorado wildfires, not to mention the thousands of people left homeless by wildfires over the past few weeks, would cause more of our civic leaders to question whether selling consumer fireworks in the middle of tinder box conditions is really worth it. But if so, you’d be wrong. Some cities still think it’s a good idea to let local charities raise money through fireworks sales. In the Monterey Bay area these cities are Watsonville, Salinas, Marina, Seaside, Soledad, Gonzales and Greenfield. Click here to view the statewide list of shame. Given the number of wildfires caused by fireworks, maybe the churches and clubs benefiting from these sales should consider donating some of their proceeds to the families of the firefighters killed last weekend. This entry was posted on Wednesday, July 3rd, 2013 at 11:48 am and is filed under Fire, Flood & Apocalypse, Politics. You can follow any responses to this entry through the RSS 2.0 feed. You can leave a response, or trackback from your own site. Preach it, someone has to stand for the voice of reason. This obsession with fireworks is over the top dangerous, and they should be banned. Period. BTW, coke and soft drinks are bad for you in any form. O calories just means aspertame or some other toxic ingredient is added to replace sugar. It’s all so not healthy. I don’t drink soda at all anymore, and don’t miss it at all. So…hows about dropping some Mentos in a organical cola?